The continent of Antarctica, located around the South Pole, encompasses about 5,400,000 square miles. It is the fifth largest continent in the world – larger than Europe or Australia – and covers almost 10 percent of the world's total land area. Its highest point is Vinson Massif, at 16,066 feet above sea level. Its lowest point is the Bentley Subglacial Trench, at 8,327 feet below sea level. Antarctica has no permanent residents, although explorers and scientists often call it home for short periods of time. Seven nations claim different sectors of the continent, but the 1959 Antarctic Treaty forbids any military activities and reserves Antarctica for free and nonpolitical scientific study. Diversified ongoing research is conducted by several thousand scientists of many nationalities. Antarctica supports a small number of land plants as well as large seabird rookeries which feed on the rich offshore food supply. The various flightless penguin species are perhaps the most famous inhabitants, and Antarctic krill are an important food source for many other species. Bounded on the north by the Atlantic, Indian, and Pacific Oceans, the cold Antarctic continent is covered by a permanent ice cap which, in some places, is over 10,000 feet thick! Antarctica plays a very important role in the Earth's ecology: it is home to 90 percent of the world's ice and 70 percent of its fresh water. Antarctica has much to do with our planet's climate, playing a major role in the circulation of ocean currents and atmospheric winds. What Does Antarctica Look Like? Many people liken Antarctica to an open fan, with the Antarctic Peninsula representing the fan's handle. Basically, the continent is a vast, snow-covered desert, with mountain ranges near the coasts. The average elevation is 6,000 feet, with elevations reaching about 16,000 feet at Vinson Massif in the Ellsworth Mountains. 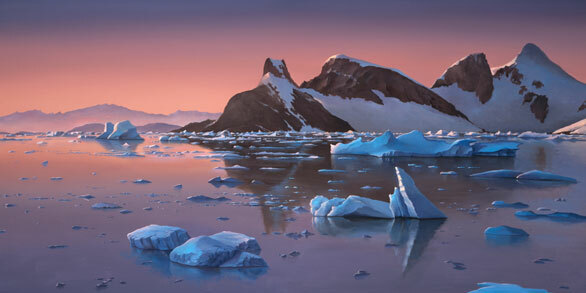 Antarctic rivers are frozen, and large bodies of ice exist along the coasts. The Beardmore Glacier comes down from the South Polar Plateau and becomes part of the Ross Ice Shelf. The portion of the Antarctic Ocean known as the Weddell Sea is located in the southernmost part of the Atlantic Ocean. The South Polar Plateau, which is the interior of the continent, lies beneath thousands of years of accumulated snow — about 6,500 feet deep. While there are mineral deposits in the mountains, it is nearly impossible to recover them. Like much of the planet, Antarctica appears to be affected by a long term global warming trend. Ice shelves along the Antarctic Peninsula have broken up, and higher than normal temperatures have caused breeding disturbances among Adelie penguins. Tourism in Antarctica is primarily by ice-strengthened passenger ships, carrying between 50 and 300 passengers. These cruises sail primarily to the Antarctic Peninsula region as well as South Georgia and the Falkland Islands. Additional Antarctic travel information is available from Cool Antarctica. Chester, J. (1991). Antarctica: Beauty in the Extreme . Philadelphia: Running Press. Hook, P. (2006). The Frozen World . London, UK: Compendium Publishing. McGonigal, D. (2008). Antarctica: Secrets of the Southern Continent . Richmond Hill, Ontario: Firefly Books. Map Of Africa - Africa maps. Map Of Australia - Australia maps. Map Of South America - South America maps.